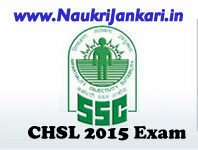 Staff Selection Commission (SSC) Combined Higher Secondary Level (CHSL 10+2) 2015 written exam has just been held today i.e. on 01.11.2015 across the country. The exam was conducted in two sessions- morning and evening. Have you wrote the exam? If so, how was your today's SSC CHSL 2015 exam? Share here your attempts and expected scores. 0 comments for " How was your today's SSC CHSL 2015 Exam (01.11.15) "